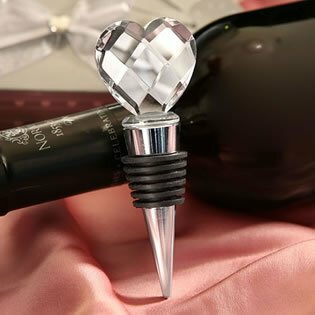 Our many-faceted chrome bottle stopper favor with a crystal heart is truly romantic, any way you look at it. Exclusively from the Choice Crystal by Fashioncraft line. "Mesmerizing" is the perfect word to describe our heart-felt bottle stopper favor that goes great with wines and spirits. The crystal heart design, from the Choice Crystal by Fashioncraft line, is carved in a brilliant pattern that catches every glint of light. A stylish chrome base adds drama. The bottle stopper favor is magnificently set in a 4.5 x 2 x 1.125 silver deluxe box with a simple heart design. White organza bow and matching thank you tag.